This blog is more of a personal diary than an attempt to market my writing and artwork, but it’s too good an opportunity not to mention that I recently had a book published by Merlin Unwin Books. 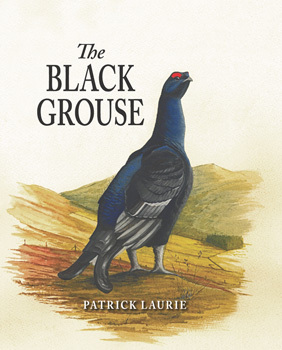 Entitled “The Black Grouse”, my book is the first text ever solely devoted to those birds. Much of the book is written from a sporting perspective in order to show how vital shooting is to the future of black grouse, and I spent two years doing research in libraries across the country, bringing together material that had never been brought together before. If you’re interested, you can buy the book from the publishers (MerlinUnwin) or, while I still have them, you can buy signed copies from me, although I only have a couple left. ‘It is clear that Mr. Laurie is a man who knows his subject not from reading books on the species, but from real life experience, from being immersed in the environment and from putting in the leg work and time’. It has also had some pretty rotten reviews, but those were all from people who oppose the idea of shooting in any form, so it’s hard to take them personally or see them as a reflection of my work. Hi Patrick,do you still have a book available? I live locally.Great blog btw.